Once we got to Jerome on Saturday, we drove to the hotel and parked the car, and then we walked everywhere we needed to go. Jerome is built on the side of a steep mountain, and our hotel was at the top end of town. Walking downhill to visit the shops and restaurants was a breeze, but walking back to the hotel was a workout! HDR created from three handheld bracketed photos (-1.0/0.0/+1.0) processed in Photomatix v4. Post-processing in Paintshop Photo Pro X3. I will be posting my shots from Jerome to a new set on Flickr–Jerome Arizona – 2011.03.12. Most of them won’t get their own blog post, but I encourage you to check out the set, especially if you have any interest in visiting the Jerome area. 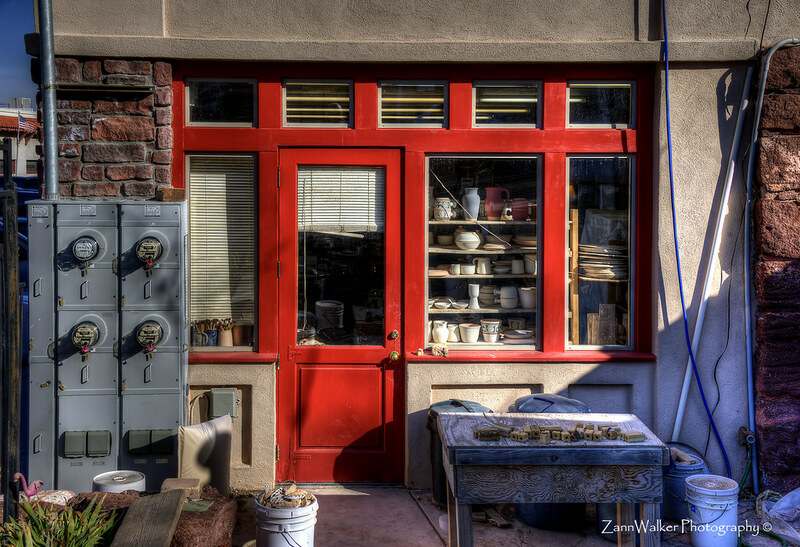 This entry was posted in Information, Shooting and tagged architecture, Arizona, AZ, building, camera, D700, door, HDR, Jerome, Nikon, Paint Shop Pro, photography, Photomatix, pottery, red, shop, tourism, window. Bookmark the permalink.